The Healthy Trees, Healthy Future programme aims to improve our knowledge of Phytophthora diseases. 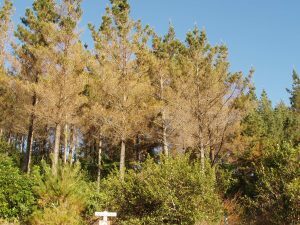 Phytophthora diseases include red needle cast in radiata pine, kauri dieback, and crown rot in apples. Other agricultural and horticultural crops are also at risk. Our Vision: to have healthy and productive trees protected from existing and new Phytophthora diseases. 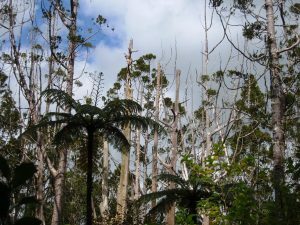 This is a six-year, cross-sector programme, led by Scion, building on existing programmes for red needle cast, kauri dieback and other Phytophthora species. breeding programmes for resistance to a broad range ofPhytophthora species. We will use a systems biology approach to characterise host-pathogen interactions from molecule to tree, and gain a better understanding of the mechanisms of disease resistance. We can then develop better techniques for identifying and managing Phytophthora diseases. Dr Nari Williams of Scion leads the Healthy Trees, Healthy Future programme. Red needle cast in radiata pine.